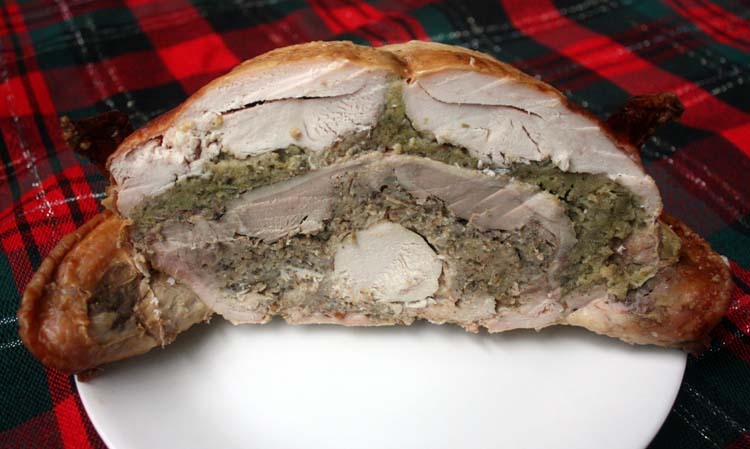 A couple of years ago I cooked a turducken for Christmas. This year, for something a little different, I decided to try a chiporken. I bought a large and a small chicken and boned them both leaving the wings and legs on the large bird. I made a stuffing based on Jamie Oliver’s recipe, from diced leg pork, bread crumbs, sage, nutmeg, salt and pepper and 3 rashers of smokey bacon. I ran this through a blender, and then stuffed the small chicken. As is usually the case, Christmas day was hot, hot, hot in Queensland, so I cooked this in our kettle BBQ, which isn’t ideal, but at least it’s outside. It’s hard to get an accurate and consistent temperature in the BBQ, and I usually have trouble judging cooking times. So I cooked the chiporken for a little over 3 hours, at some largely unknown and varying temperature, until a meat thermometer told me it was 175°C in the middle. As it turns out, that meant it was somewhat overcooked on the bottom, a regular feature of roasts done in my BBQ (maybe it’s me? ), but it sure looked good from the top! It wasn’t as tasty as the turducken, but was pretty good, certainly an improvement on plain chicken. And if I do it again, well definitely at least twice as much bacon wrapped around the inside bird. 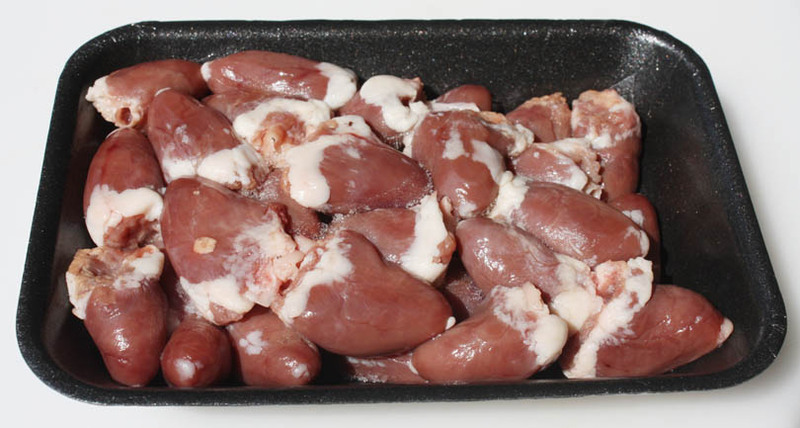 I’d had a pack of chicken hearts in the freezer for quite a while, so finally it was time to try them. 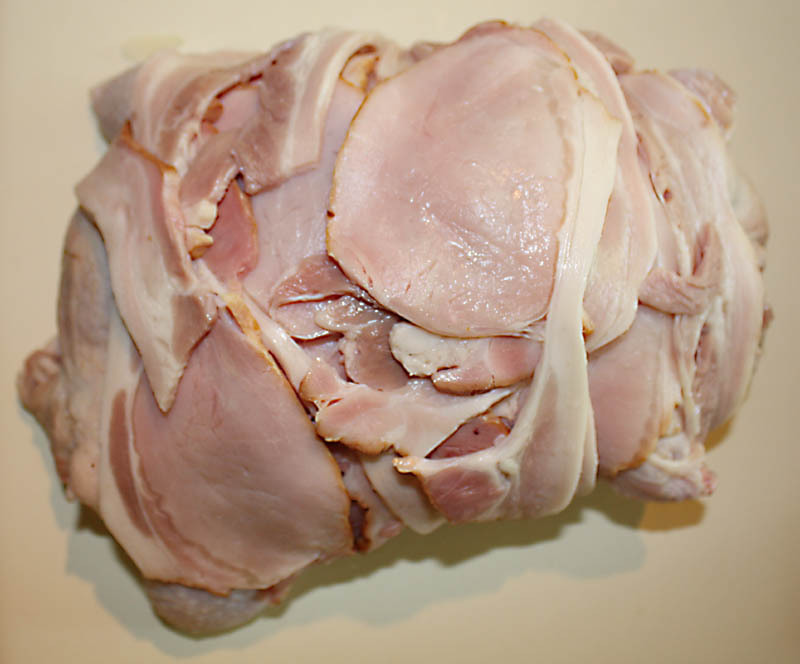 They’re not much to look at, but a lot of the things I eat are worse looking than this. They had been prepared by the butcher, with the tops cut off, removing any veins, and some of the fat. I found quite a few different ways to cook the hearts, but I was hungry, so I took the easy option, and just pan fried them in oil, with garlic, until they browned up nicely. I think they look a lot nicer cooked than raw! And they are so good to eat. A little bit chewy cooked this way, but by no means tough, quite a nice texture really. They had that lovely chicken skin, fatty flavour that I love. I saved a few for the next day and ate them cold, and what a great snack they are. Delicious with a cold beer. It’s a pity that they are high in cholesterol, or I’d eat them often. I read in the paper recently about a Sunshine Coast butcher making award winning sausages. 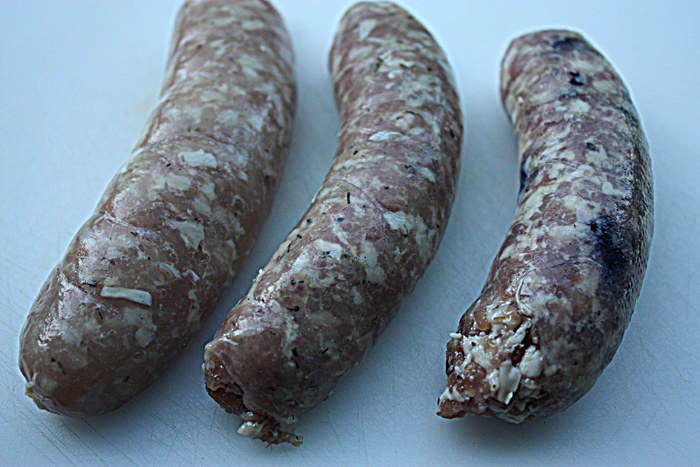 I have eaten gourmet sausages before, most recently from a market in Melbourne, and have been unimpressed. They are mostly nice but not spectacular, and not usually worth the premium price charged. But I’m a slow learner and obviously influenced by the media, so on the weekend, off I went to Master Meats at Mooloolaba to buy a few. Walking into the shop is like being hit in the face with the best piece of bacon you ever had, the butchers have a smoke room at the back of the shop, and I think the aroma is probably the nicest I have ever smelled. I’m sure the smell alone doubled the number of sausages I bought. They make a good range of gourmet sausages, we tried Pork and orange with honey blueberries, Turkey cointreau and dill, Red wine beef and caramelized onion, Calabrese ( flavours of fennel,garlic and cayene pepper), Lemon chicken and Chicken orange and thyme. 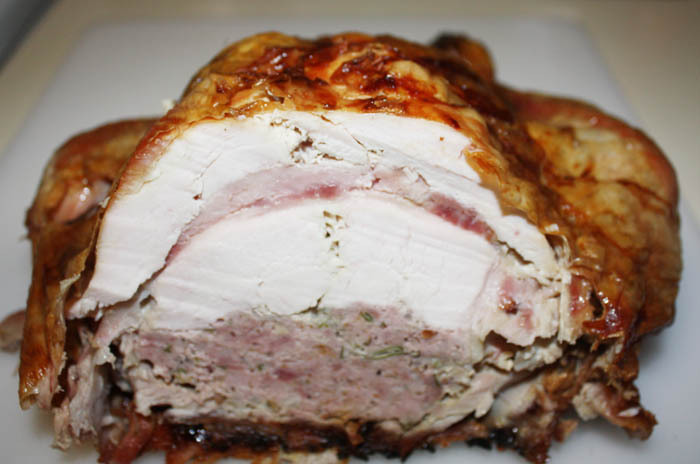 The Pork and orange and Turkey and cointreau are the flavours that won awards. All the sausages are flour and preservative free. 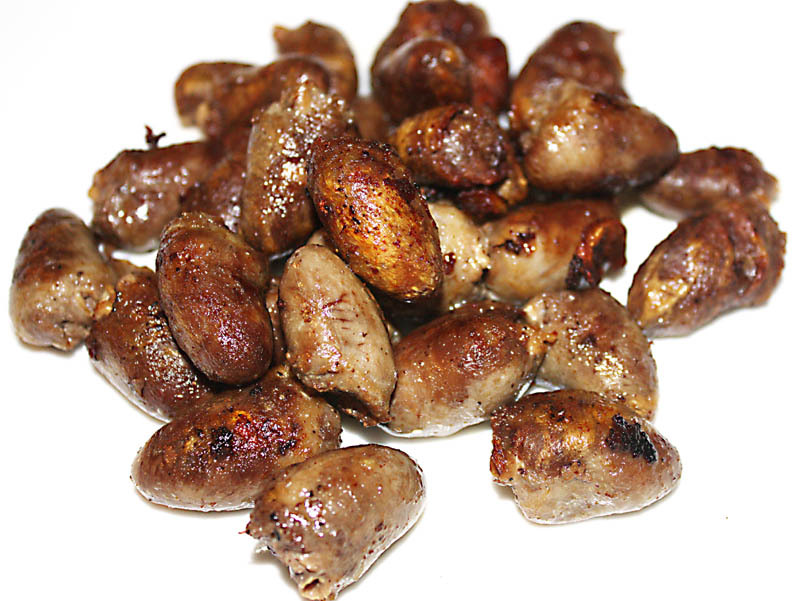 They were all very jucy when cooked and had a much courser texture than your average sausage and I like that. It really makes them seem more substantial. They were all very good sausages, but to me, the Pork and orange and the Lemon chicken were spectacular. I rarely eat sausages but that might now change. It’s now Wednesday and I’ve already been back for more! 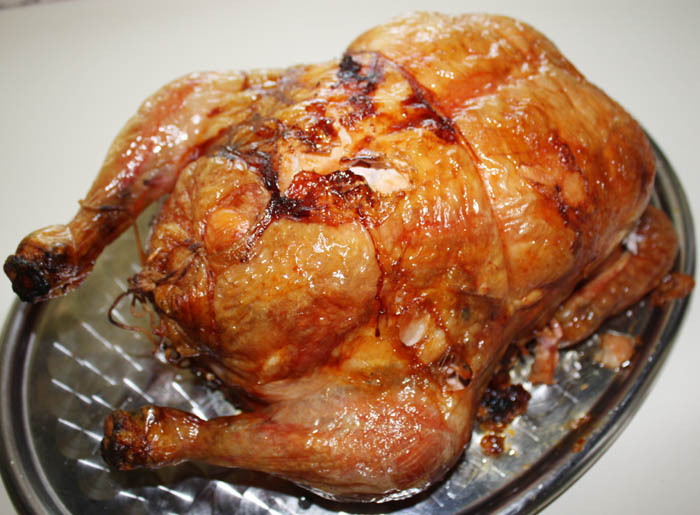 I have not done a lot of cooking over the years ( probably only roasted two chickens in my life! 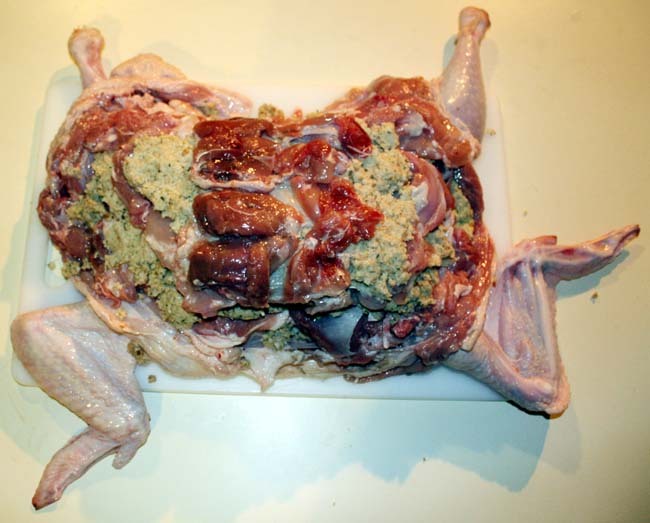 ), so my plan to make turducken this Christmas was perhaps a little ambitious. In my usual way, I threw myself enthusiastically into the project, ordered the birds, read up about the process and sharpened my knives. I practised boning a couple of chickens a week ago and the second one was good enough, so I kept it in the freezer for the big day. Christmas eve and the serious boning began. I started with the duck as it’s appearance isn’t as important as the turkey. One badly sliced thumb later (yes, that knife is sharp) the duck was done and it was turkey time. 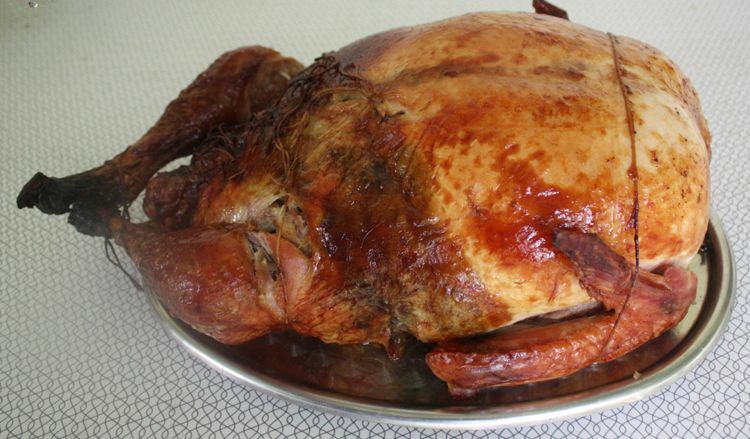 The turkey, being larger, was probably easier than the chicken or duck, and went quite well. I then decided to put a couple of quail inside the chicken, and the quail were quite fiddly to bone because of their size. Finally, after a couple of hours it was all done and the carcases were frozen to use for making stock later. 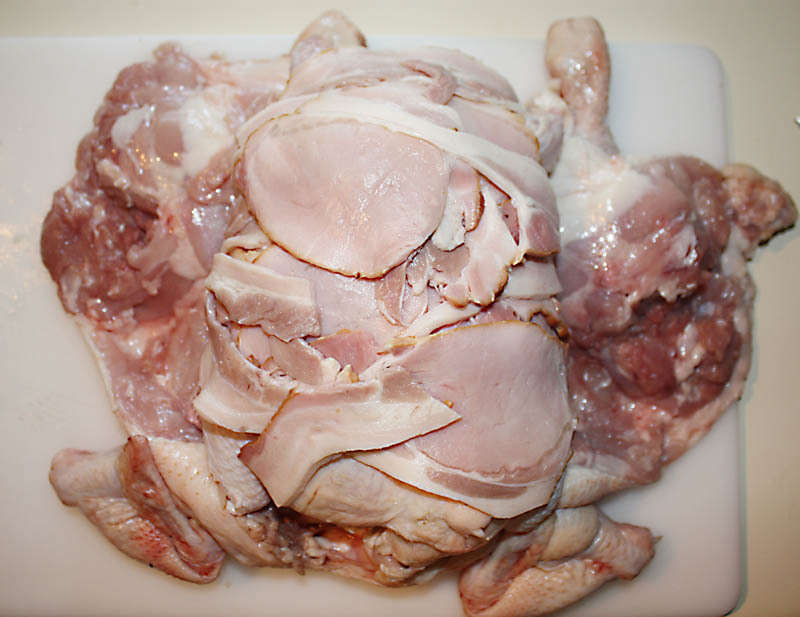 The butcher I bought the turkey and duck off had offered to do the boning for me but I wanted to do the whole thing. Several times during the evening I regretted that decision. 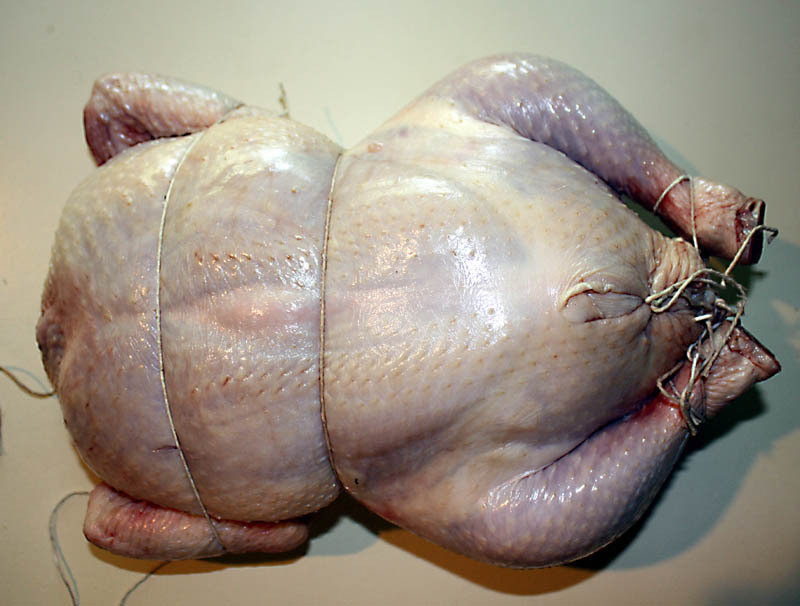 As you can see, my turkey didn’t look elegant, but it was boneless and all in one piece. I thought it would take about 5-6 hours to cook this masterpiece, so I was up at 4am Christmas morning to complete the prep. and get it in the oven. As I had never made stuffing before, I used it from a packet (sorry, I’ll do better next time). 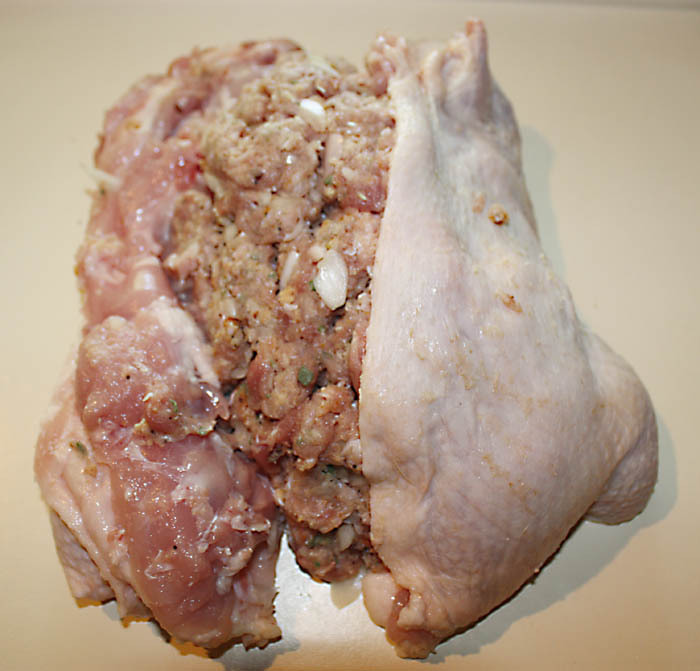 So, I layed out the turkey, spread a layer of stuffing, put the duck on, added more stuffing, then the chicken, stuffing and finally the two quail to end up with this great ugly pile of meat. The next part of the process was probably the most difficult, particularly on my own. I had to roll the beast up and sew the turkey back together. Using skewers to initially hold it in place, I finally managed to get it sewn together, but when I turned it over, there were a couple of places where the skin had split, and these required a few stitches as well. I also ran string around the bird to help it hold it’s shape (no skeleton to do that, remember). So it looked a bit rough and unprofessional, but not bad for a first effort, I thought. Cooked to perfection! And to eat, this is awesome. 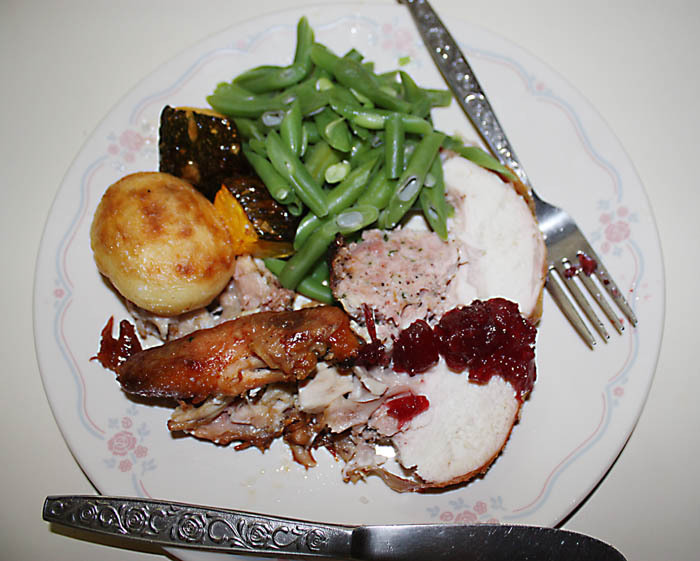 The flavour combinations of the different birds are great together, the turkey was very moist, probably from the duck, and even the packet stuffing tasted good. Would I do it all again, yes, but not for a while. And what would I do differently? The quail were pretty much lost in the mix, I’d either leave them out or put a few more in. 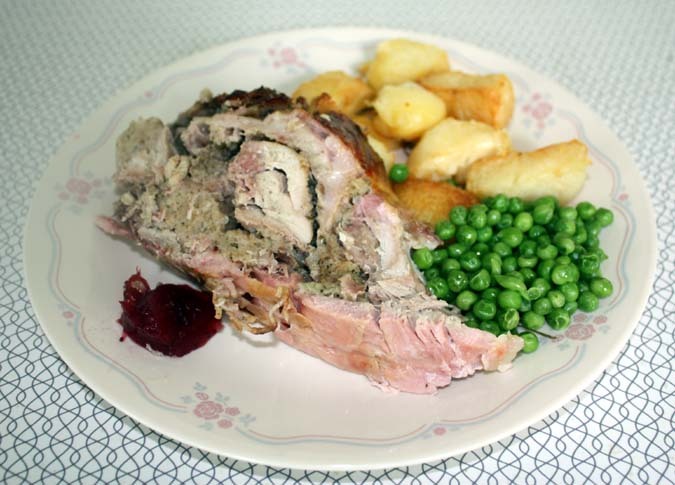 And I’d use less stuffing and not from a packet (I’ll have to find a couple of good stuffing recipes). 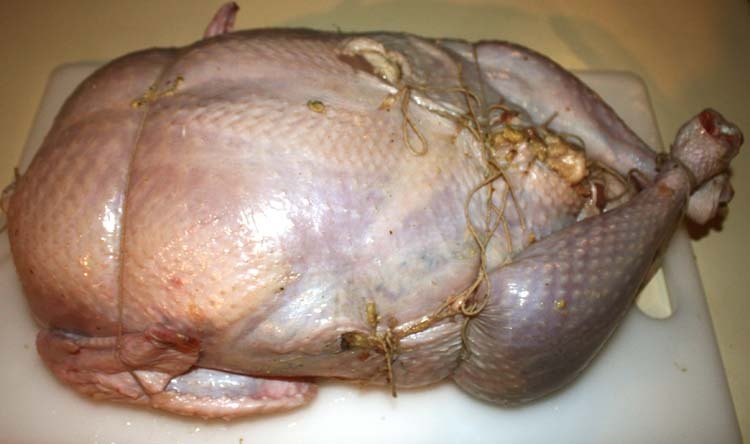 And maybe a bigger turkey so fitting it all together was easier (this was only a 4kg bird). All up, the cooked product weighed in at just under 8 kgs, so I’ll be enjoying this for a few days yet.